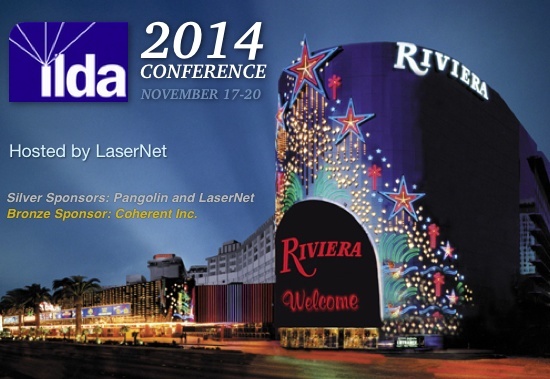 The International Laser Display Association met November 17-20 in Las Vegas, for the 2014 ILDA Conference, hosted by Tom Harman of LaserNet. 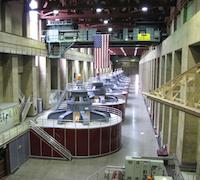 The Conference included an optional insider tour of Hoover Dam on Nov. 20. As a bonus, the LDI lighting, sound, and production exhibition was Nov. 21-23 at the nearby Las Vegas Convention Center. Sunday, Nov. 16: Golf outing organized by Tim Walsh at 2 pm, at the Las Vegas Golf Club. Contact Tim directly if you want to participate. Monday, Nov 17: Optional Laser Safety Officer class (additional registration fee applies) and user group meetings. The first official ILDA event is the Welcome Reception and Dinner in the early evening. Tue.-Wed., Nov 18-19: ILDA Conference, including business meeting, seminars, Lase-Off, Laser Jockey voting and Awards Banquet. All meals are included with Full Conference registration. 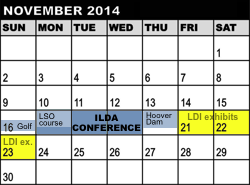 Fri.-Sun., Nov. 21-23: LDI tradeshow exhibits (not part of ILDA, but of interest to most Members and attendees). See below for a free pass to the LDI tradeshow exhibits. 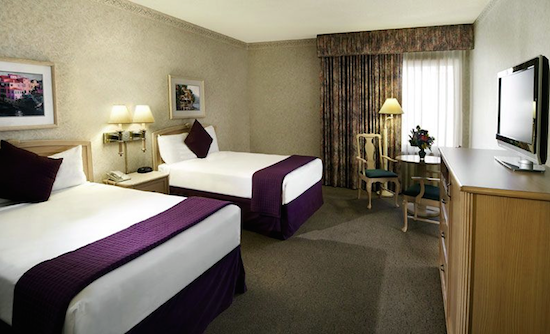 ILDA's headquarters hotel is the recently remodeled Riviera Hotel Casino. All ILDA events will take place in the Riviera. And, if you're staying over for the LDI show, the Riviera is the closest major resort on the Las Vegas Strip to the Convention Center (click on map on right for details). To get these rates, you must book directly with the Riviera as described below. Incidentally, ILDA's rates are substantially less than the LDI show hotel rates, which range from $60 to $152. Important note: If you book your room directly with the Riviera, you will receive a $250 credit on an ILDA Full Conference registration. This is because we have contracted with the Riviera for food and meeting rooms, based on each attendee staying at the $49/$79 rate. For all Full Conference attendees not on that rate, then we owe the hotel additional money which comes from ILDA Full Conference registration. This is why Full Conference registrants booking rooms at the $49 or $79 ILDA rate will save $250 off the normal Full Conference registration price. Register for the Conference by visiting the ILDA Event Registration webpage. If you have any trouble registering, or if you have special requirements, contact ILDA directly and we will help. • Full Conference Registration includes breakfasts, lunches and dinners, Welcome Reception and Dinner, Lase-Off, Awards Banquet, General Business Meeting (ILDA Members only), seminars and workshops. Full Conference rates are as shown below. • Spouse/Guest Registration includes breakfasts, lunches and dinners, the Welcome Reception and Dinner, the Lase-Off, and the Awards Banquet. It does NOT include the General Business Meeting, the seminars and workshops. (A spouse/guest is defined as someone staying in the room of a person who has registered for the Full Conference.) The registration fee for a spouse/guest of a Member is $375. • Tim Walsh's Golf Outing is held Sunday, November 16 starting at 2 pm, at the Las Vegas Golf Club. The approximate cost will be $150. Interested persons should contact Tim directly -- ILDA is not handling registration or fees for this. 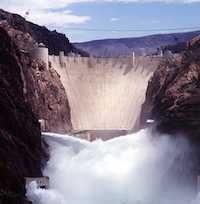 • The Hoover Dam motorcoach tour on Thursday, November 20, is limited to 50 persons. So if you want to go on the tour, be sure to select it from the ILDA Event Registration webpage. The cost is tentatively $80. We are charging this amount on the ILDA Event Registration webpage. If the cost is more we will collect it before the tour; if less, we will refund the overage. • Lase-Off/Laser Jockey, $150 as a single event. This includes the dinner beforehand. • Awards Banquet and Presentation, $150 as a single event. This includes the Awards Banquet dinner, plus the Awards Presentation event. The LDI lighting, sound and production tradeshow exhibition takes place Nov. 21-23, after the ILDA Conference is over. To get free exhibit registration, go to the LDI registration page, and enter the Customer Code GDP4. Tim Walsh of Laser Spectacles is organizing a golf outing at the Las Vegas Golf Club. The approximate cost will be $150. Interested persons should contact Tim directly -- ILDA is not handling registration or fees for this. The LSO course is NOT included in Conference registration. The cost through August 15 is $525 for Members or $775 for non-Members. August 16 and later, pricing is $625 and $875 respectively. Open to anyone interested in Pangolin products and services. No preregistration required; just show up. Do not need to be registered for the ILDA Conference to attend the PUG meeting. Includes reports, plus nominations, speeches and election of Board of Directors. Three seats expire this year, currently held by Christine Jenkin, Olga Eser and Alex Hennig. Must be a Full Conference registrant, spouse/guest registrant, or have purchased a Lase-Off/Laser Jockey/Buffet Dinner ticket for $150. Laser Jockey Performances and Judging: Anyone who wants to enter the 2014 ILDA Awards "Laser Jockey" category will perform live to music. Everyone in attendance will vote for their favorite. ILDA IDN networking standard. Benefits, throughput, performance measurements. Wave/frame sample stream coding. Q&A and discussion. Must be a Full Conference registrant, spouse/guest registrant, or purchased an ILDA Awards Banquet ticket for $150. See 2014's top laser shows. We will board a motorcoach for the Hoover Dam, located 30 miles southeast of Las Vegas. Our group will first tour the Visitor Center, which introduces this engineering marvel. Then we take an elevator 530 feet (160 m) to the Powerplant. We'll see one of the four 30-foot diameter pipes that bring in 90,000 gallons (340,000 litres) of water every second to the generators. In the 650-foot long (200 m) hall, 17 gigantic generators with a total output of 2.2 Gigawatts. Power from here is furnished to Arizona, Nevada and all the way to Los Angeles, 285 miles away. Finally, we re-emerge to the surface, where we can walk on the Observation Deck and the top of the dam, viewing the two huge intake towers, one in Nevada and one in Arizona. LaserNet has discounted tickets to this high-energy dance crew, with lasers, at the Luxor. Category A tickets, normally $100 are $77.46. Category B tickets, normally $85 are $66.29. Write directly to chris@lasernet ASAP to book these tickets; We need 25 to get this discount. The following persons were registered for the Full Conference, as of Tuesday Nov. 11 2014 at 9:00 am EST. Please visit our older website for reports about the 2014 Conference in Las Vegas. There are five webpages of reports. These include numerous photos and detailed descriptions of the events.